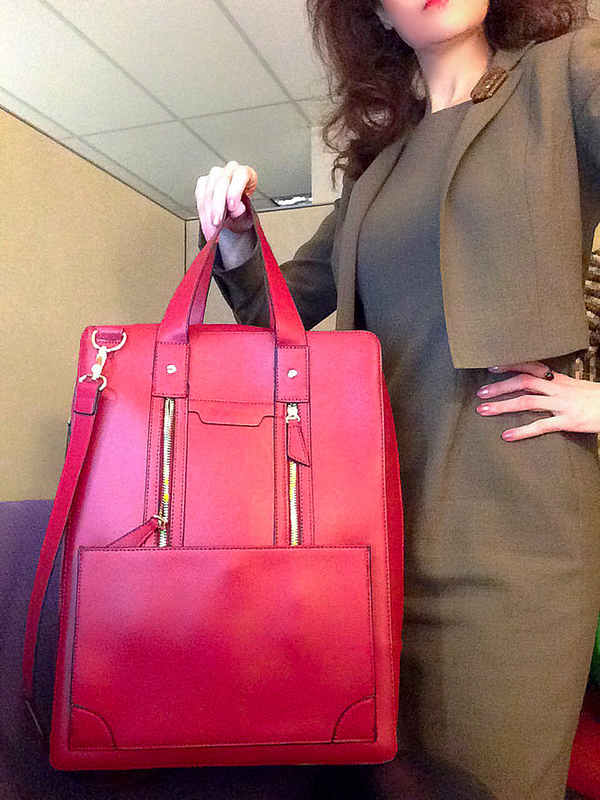 Need a professional, feminine, yet stylish laptop case for work? Most technology cases are functional but unfortunately strictly utilitarian looking, which leaves much to be desired for more stylishly dressed professionals. 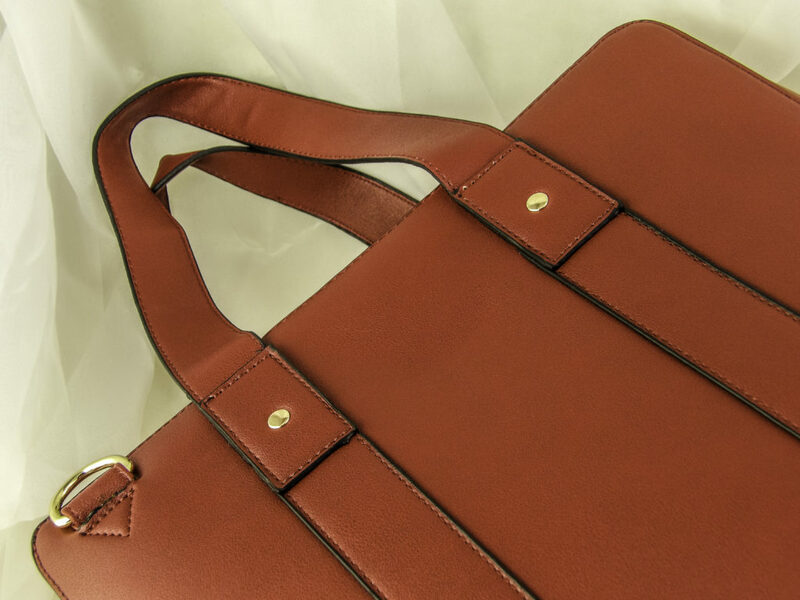 If you want a laptop case that compliments your wardrobe instead of distracting from it, then check out this Estarer Women’s Leather Laptop Briefcase. 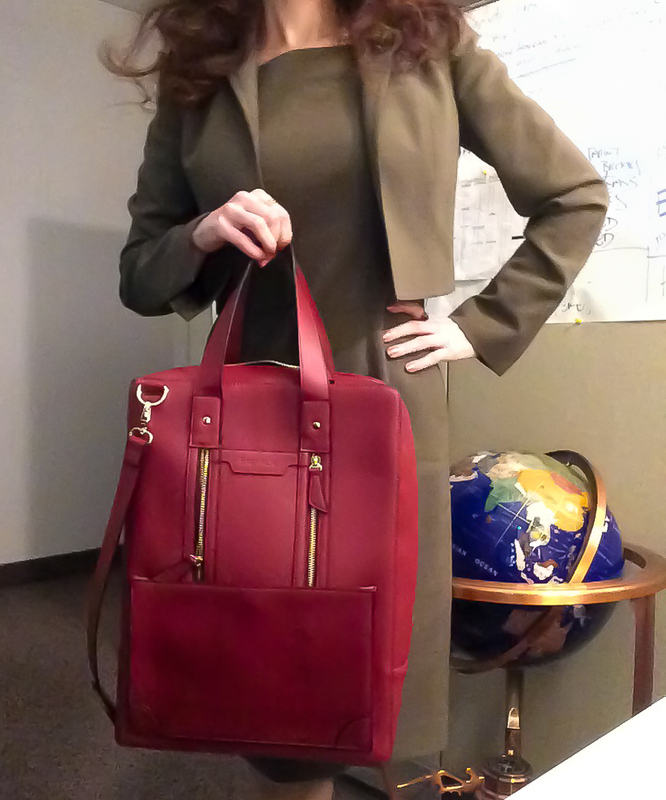 This Estarer Women’s Leather Laptop Briefcase is a vertical briefcase that resembles the appearance of a handbag while securely holding laptops up to 15.6 inches. 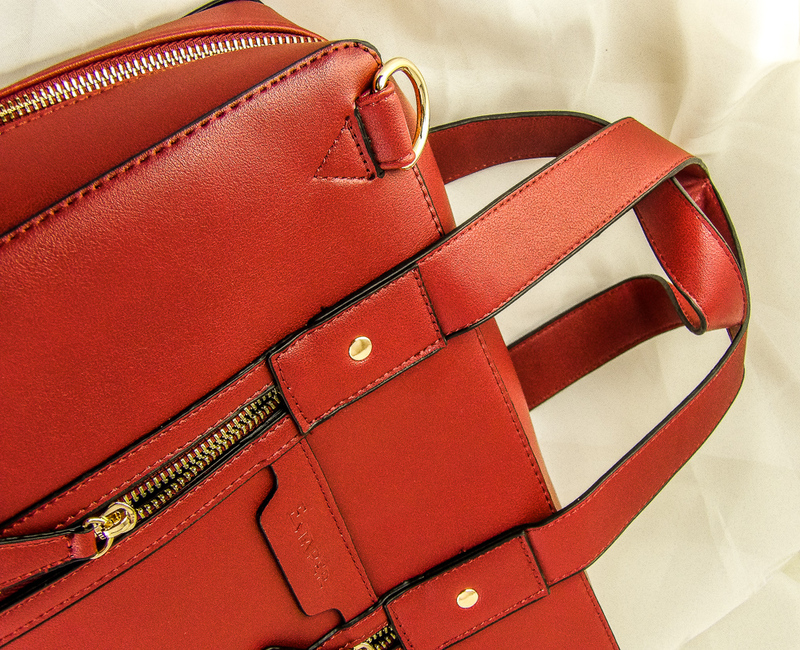 It has multiple pockets to hold your wares or accessories so you can carry your laptop, tablet, notepad, phone, pen, business cards, and even keep a small makeup bag and wallet discretely in one easy to carry case. 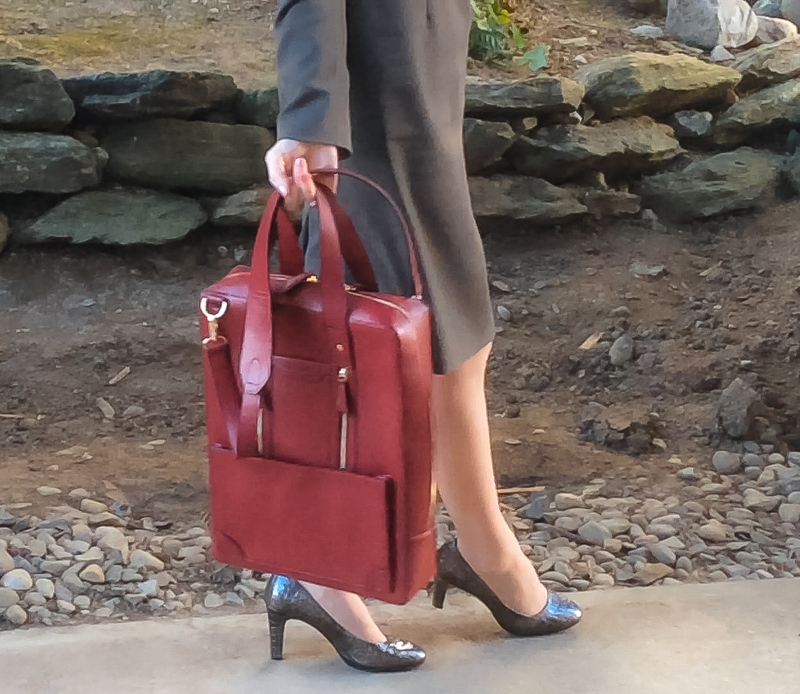 Estarer Women’s Business Briefcase Leather Shoulder Laptop Bag holds laptops up to 15.6 inches. MATERIAL: Made of PU Leather which is a split leather with a layer of polyurethane applied to the surface and then embossed. This retains the aesthetic of leather but with the durability to withstand rain and resist scratches that can occur while the bag is in transit. SIZE: The bag is 12″ long by *3.5″ wide by *16″ high. It can hold a laptop up to 15.6 inches. 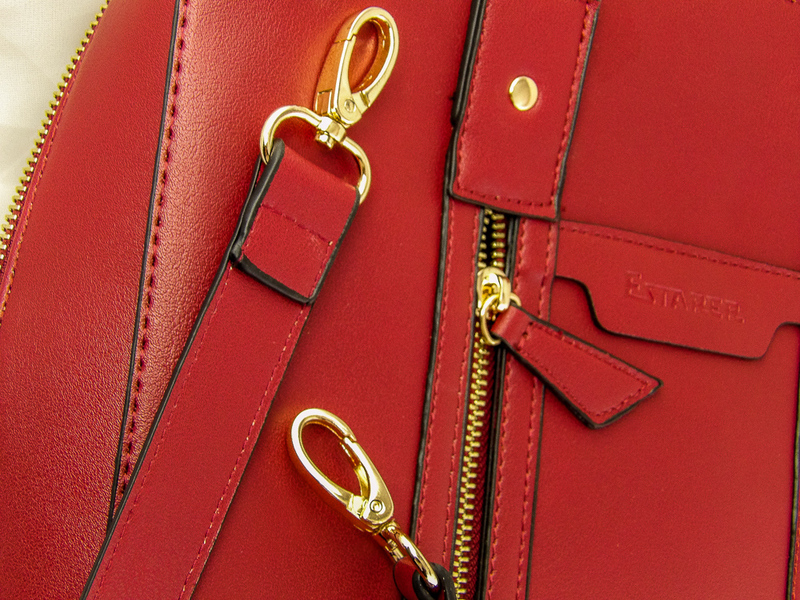 VERSATILE COLORS: The bag comes in black, red, wine red, and brown. This easy to carry bag has two drop handles and an optional detachable shoulder strap. It’s ideal for those who work in professional fields that require looking put together, such as sales, designers or artists. 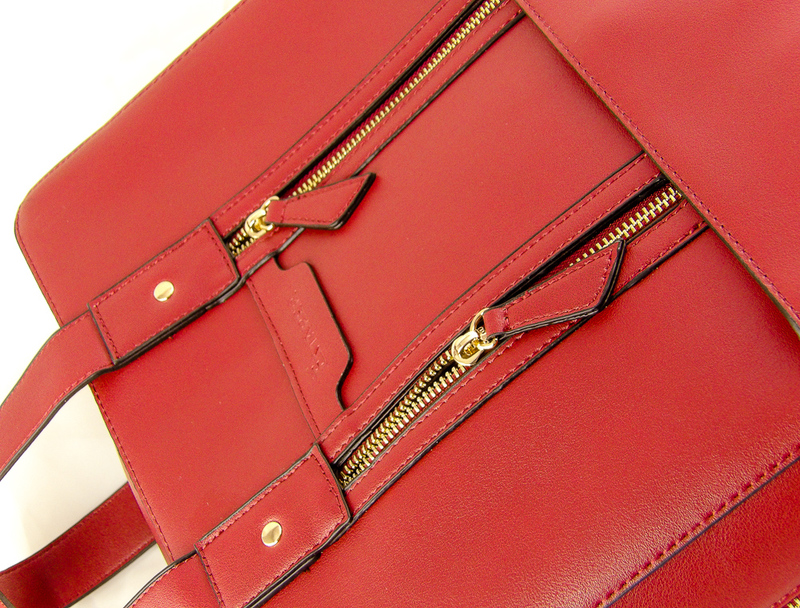 I like having a bag that I can carry my MacBook so that it stays protected yet looks stylish and sleek. 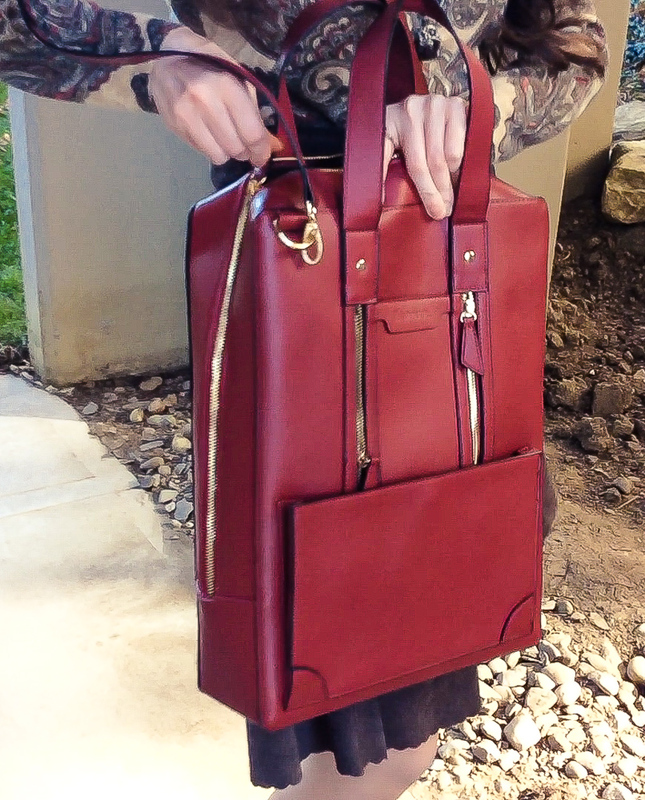 There are two ways to carry the bag, top drop hand handles and by shoulder-strap. TOP DROP HANDLES: The top handle is for carrying the bag by hand and has two handle straps that are well stitched and sturdy, each is about 6.8″ high and is comfortable in the hand. 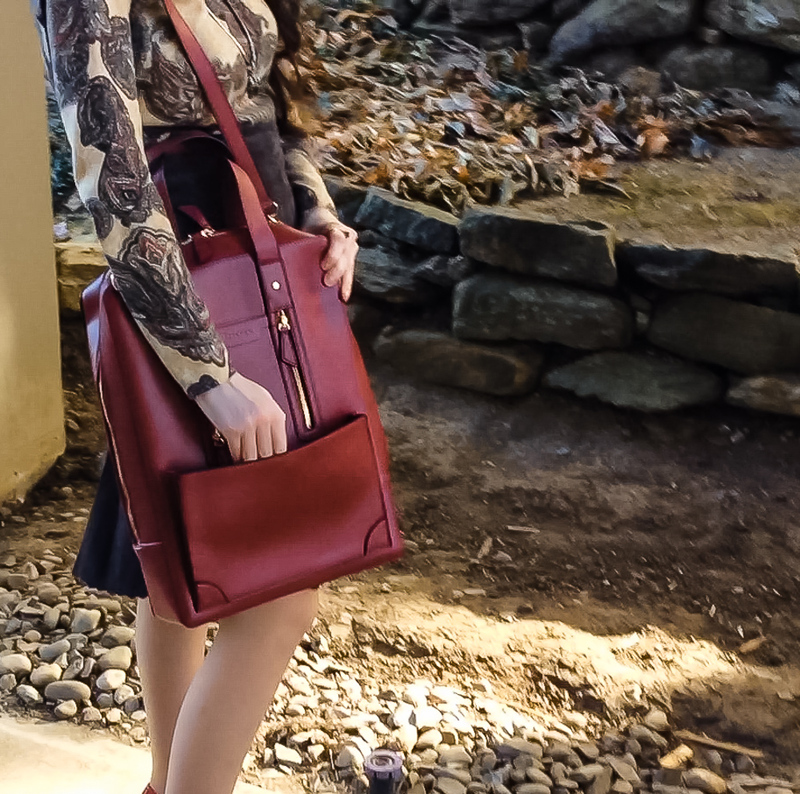 DETACHABLE SHOULDER STRAP is about 34″, so it can be worn off the shoulder or across the body like a messenger bag if desired. 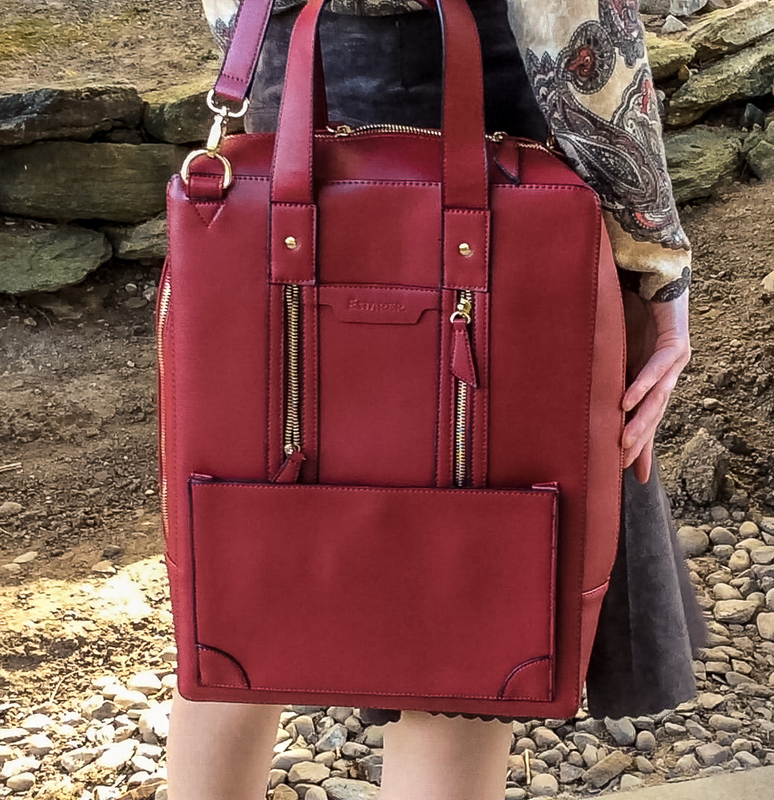 The bag is ideal for bringing my laptop to the office, the handles are easy to grip and well support my laptop, tablet and power cords while looking stylish. 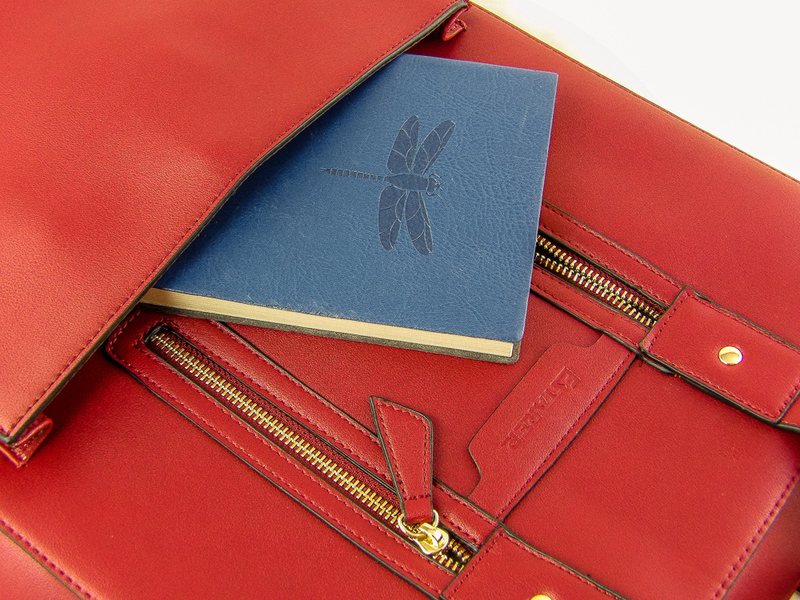 The color provides a nice pop of color for those who work in a more conservative corporate office or law firm. Here is a close up look at the handles. The handle drop is generous and I find it to be comfortable to hold the bag with my hand or loop it over my forearm when necessary such as when I holding keys or a cup of coffee in my hand or extending my hand for a handshake. FULL HALF OPEN EXPANDABLE POCKET: 1 front access full-length open pocket for holding a notebook, phone, earbuds, pens, or sunglasses, etc. FRONT ZIPPER POCKETS: Two zippered thin pockets for quick access to a phone, PhotoID, or other small items such as business cards, which is convenient to be able to access your cards so quickly when meeting someone, yet keep them neat and orderly. Two zipper pocket offer secure but quick access to a slim, wallet, USB, cables, wares, or personal accessories such as a lipstick or business cards for fast access. 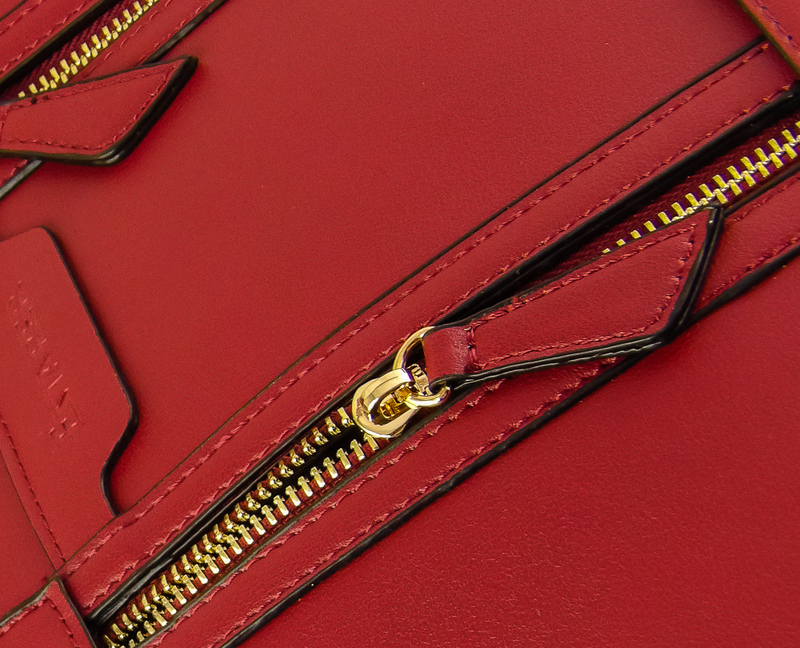 The stitching is well done with no loose or uneven threads. 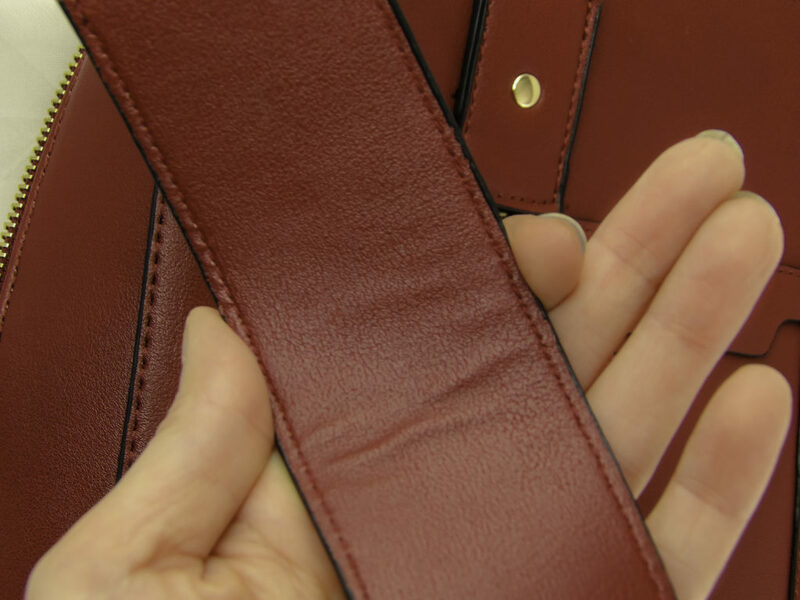 The straps and durable and do not readily show signs of wear. The treated nature of the material helps it avoid scrapes and scratches and resist moisture. I prefer laptops on the larger side, at least 15 inches. But finding an attractive case that looks professional for this size laptop can be difficult. I also prefer that a laptop case does not look like a blatant laptop case for some safety while commuting or carrying it in public. I like that this case appears more like a vertical bag than a laptop briefcase per say, yet it still looks very professional and it is not bulky or cumbersome. The bag compliments many items of clothing that I tend to wear to work. 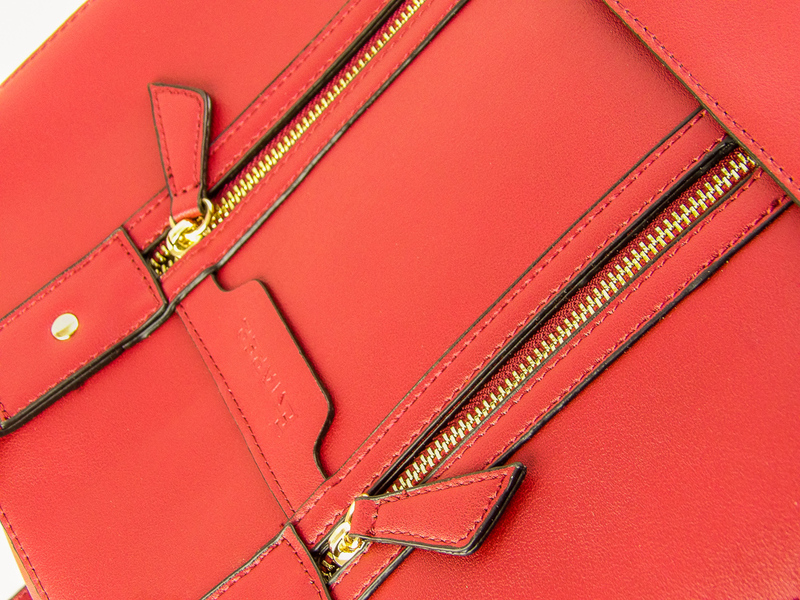 Despite being slimline and sleek, the laptop compartment is well-secured and padded nicely. 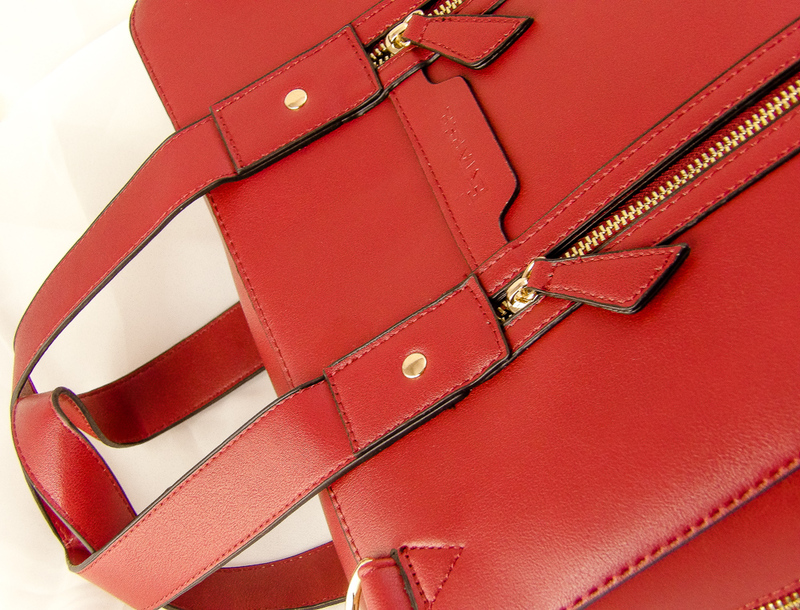 It is comfortable to carry by the hand straps or the detachable shoulder strap. The strap is long enough for me to wear it across my body if I wish to carry the bag close to my body or even underneath my coat while traveling or walking through busy city streets. It securely holds my 15.6-inch laptop or my 15 inch MacBook. 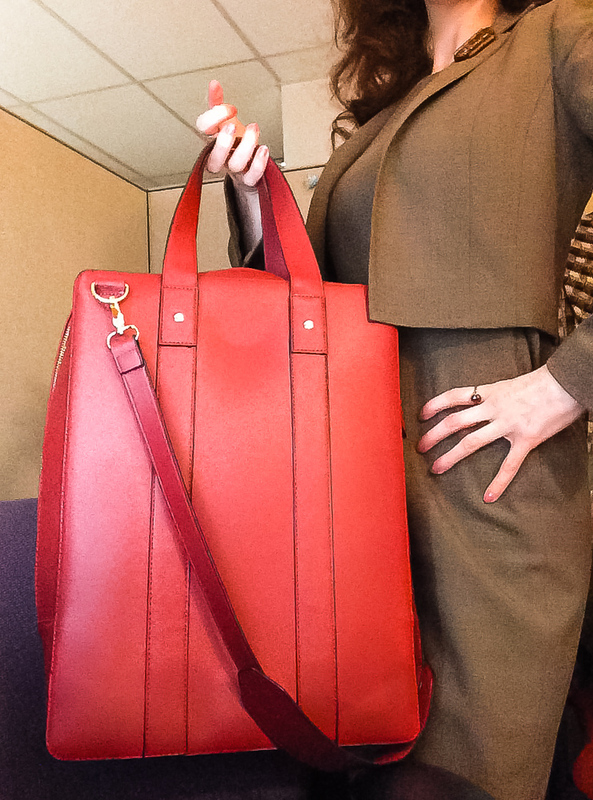 I like having a stylish bag to carry my MacBook for presentations and meetings where design elements are presented. It can also hold my iPad or other tablet, charger cords, my phone and a few small personal items such as mints and a lipstick, and it is easy to access the front pocket and zippered cases without having to open the main bag compartment. While a backpack style laptop holder is convenient, it is not necessarily professional looking for an office worker, salesperson, artist or consultant. A backpack can also wrinkle your work clothes, giving a less professional, unkempt appearance. 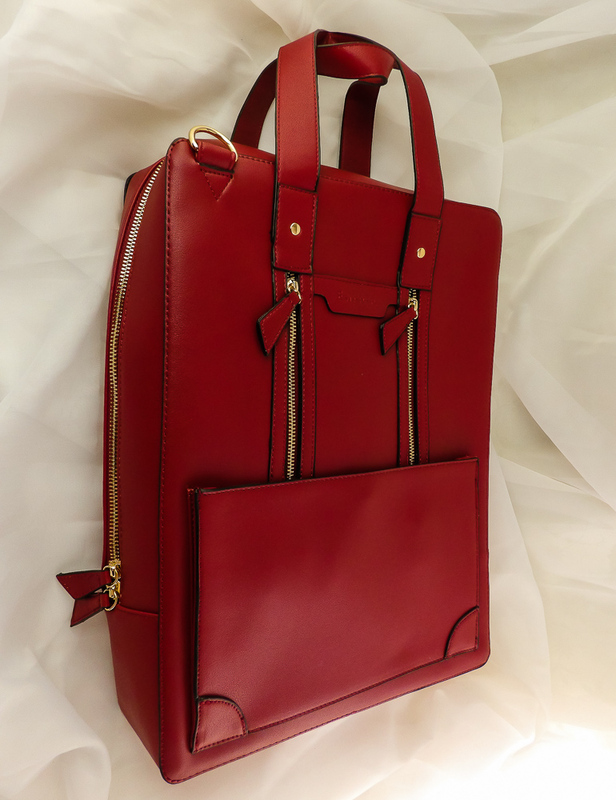 The option of either carrying by hand or shoulder strap keeps my blazers, suits and dresses presentable without the crush marks that laptop backpacks can make on my clothes. 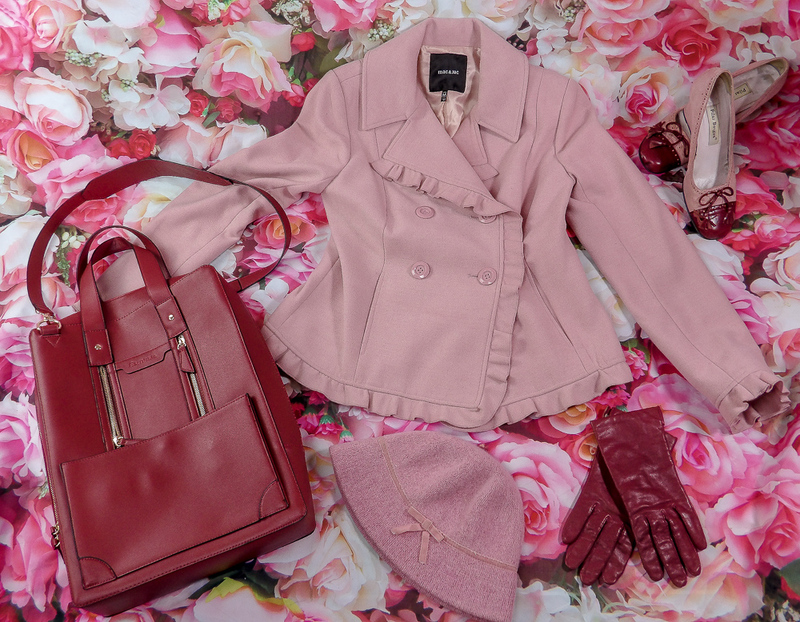 Estarer Women’s Leather Laptop Briefcase matches feminine and professional outfits and the colors are so versatile! The perfect companion for the on-the-go professional, the Estarer Women’s Leather Laptop Briefcase is stylish, slimline and sleek. It is comfortable to carry while still transporting all my necessary work equipment. 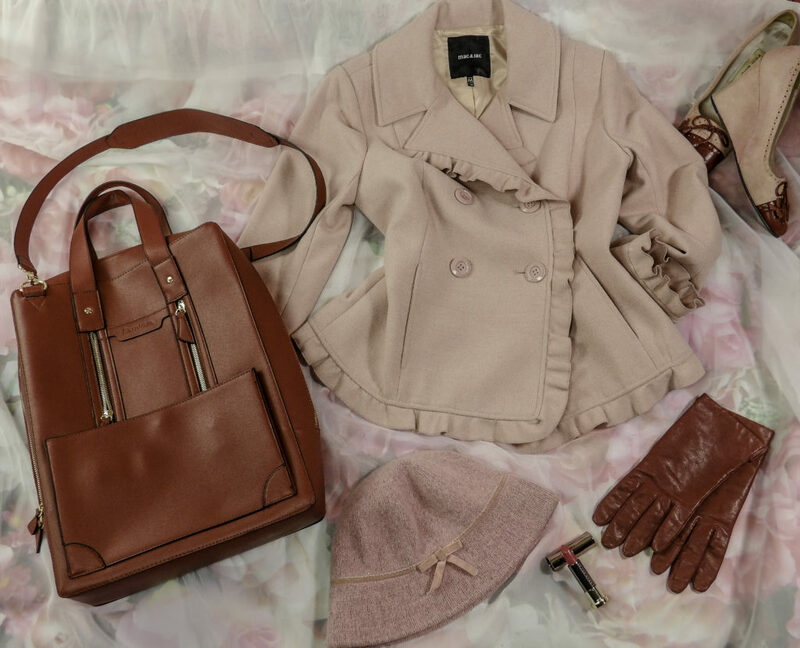 It looks feminine while being minimalist enough to appear professionally attired while carrying a laptop or presentation materials discretely. 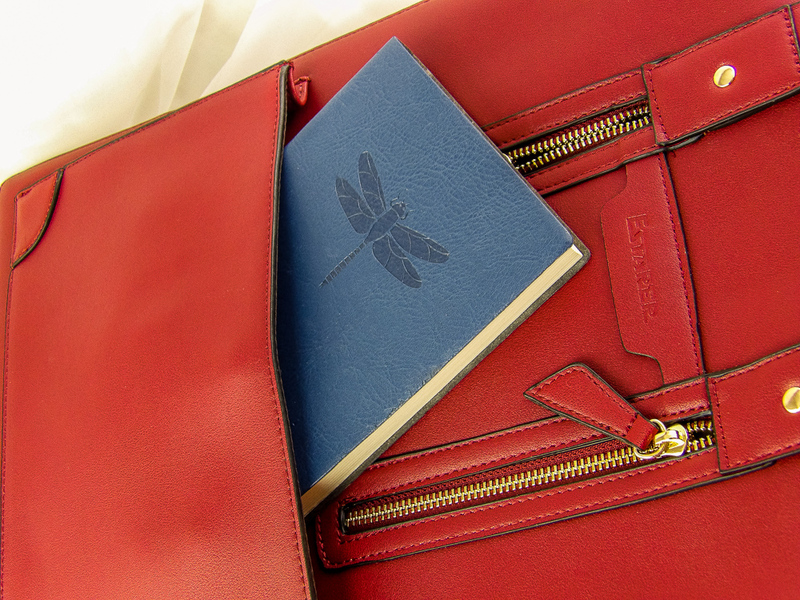 Unlike many laptop case bags, it is not utilitarian or dull. 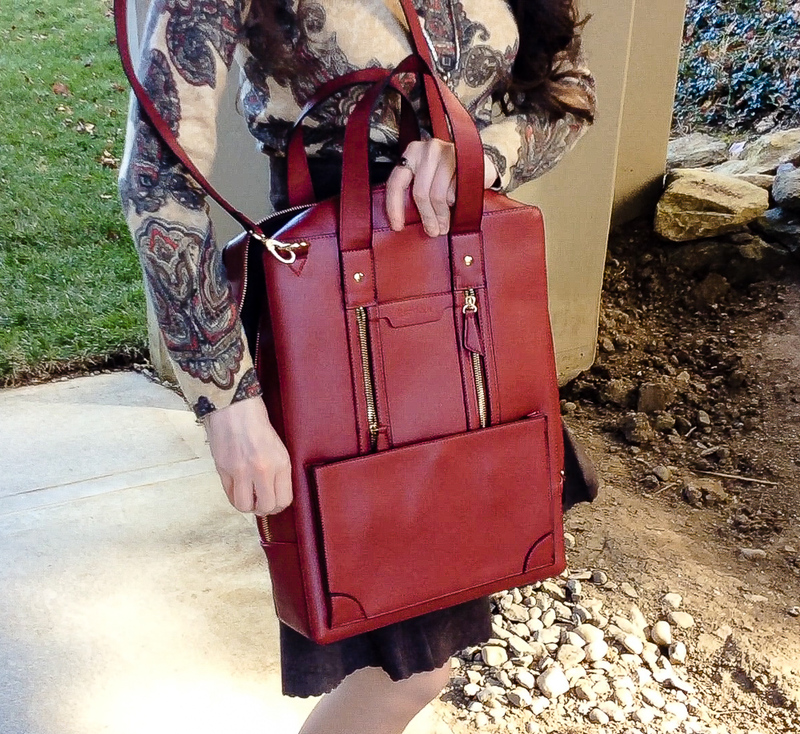 The bag comes in several neutral and versatile colors that work well with most wardrobe choices, making it an ideal choice for those who work in the arts, sales, consultants, advertising, legal professions, academics, or anyone who does presentations or brings their laptops with them to work. Sturdy enough to protect the bag but not heavy or cumbersome, I love having a discrete, attractive way to transport my mid to larger sized laptops that is not bulky or cumbersome. 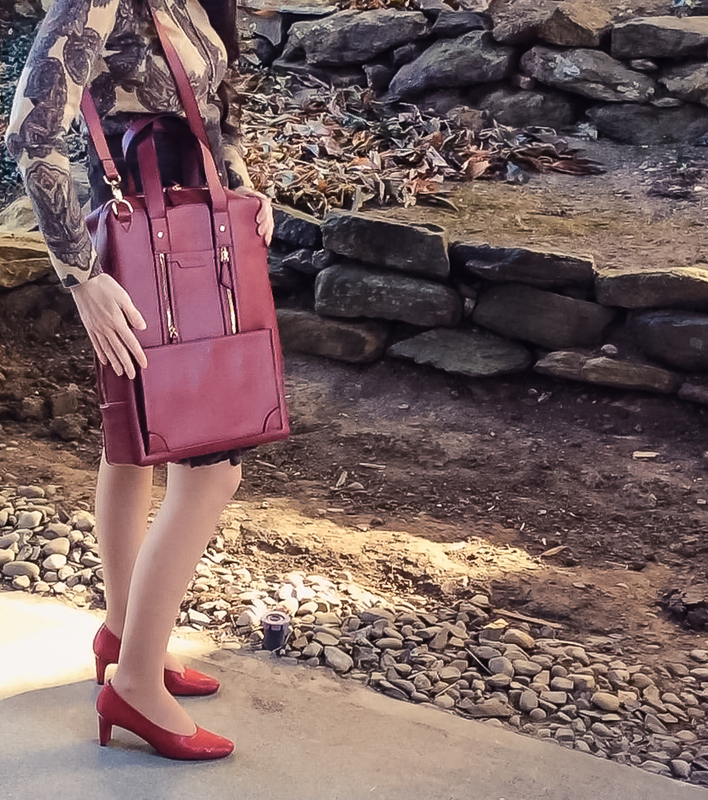 Style Chicks received the Estarer Women’s Leather Laptop Briefcase in exchange for our unbiased review and received compensation for our time and effort. However, our experience with the product and the opinions expressed in this review are 100% ours.